By Kori ~ November 26th, 2008. This time of year with the holidays rapidly approaching, my â€œwineâ€ attention tends to focus on bubbly. 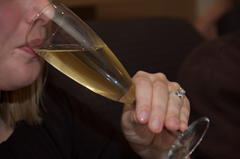 I absolutely love sparkling wine but do not drink it often enough. However this time of year, I make sure to celebrate with friends and family and enjoy some sparkling wine. With that in mind, it was easy for us to choose the theme for this monthâ€™s wine tasting dinner. We selected six sparkling wines to blind taste to help us, and hopefully you as well, choose an excellent sparkling wine to enjoy as an aperitif before Thanksgiving dinner, to take to the in-laws on Christmas, or to pop on New Yearâ€™s Eve. We had a wide range of bubbly in this tastingâ€”three from the United States (one each from Oregon, California, and New Mexico), one from France, one from Italy, and one from Spain. 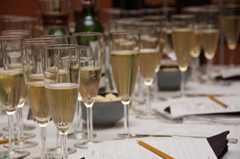 The most surprising thing to us was that they finished in that order in the group consensus rankings; the three U.S. sparkling wines finished 1-2-3, and the one true Champagne finished 4th. The top three wines also received a QPR rating of 5 bangs for your buck. All three (Argyle Extended Tirage, Domaine Carneros, and Gruet) are excellent wines and excellent buys. And even the Freixenet that finished in sixth place is a QPR 5; while not as good as the top three in terms of quality, it is nevertheless a great value in the under $10 price point. All of these sparkling wines paired nicely with Momâ€™s dinner menu which included butternut squash soup with curry, mixed green salad, pistachio-encrusted chicken breasts with a cream gravy, risotto, sautÃ©ed mixed vegetables, and sorbet for dessert. If you havenâ€™t had one of the top three sparklers listed below, I encourage you to pick up a bottle to enjoy this holiday season. And if you donâ€™t see your favorite sparkling wine on this list, let us know in the comments as weâ€™d like to try it. 1997 Argyle Extended Tirage Brut (Willamette Valley, Oregon): Small, very fast beads. The nose is a bit tight at first. Pear, apple, and hints of nuts come through on the palate. Very crisp and fresh for an 11 year old sparkler. 2004 Domaine Carneros [Taittinger] Brut (Carneros, California): Aromas of melon and vanilla lead to flavors of apple and a bit of spice. Very crisp and refreshing. NV Gruet Brut (New Mexico): Distinct aromas of citrus, especially grapefruit, come through on the nose. Smells a lot like a New Zealand Sauvignon Blanc. Hints of butter and vanilla mingle with the citrus on the palate. Crisp acidity. Also, The 89 Project, in concert with Twitter Taste Live, is holding its first contest. The prize is free wine. How cool is that?